The My Best Friend Fork is the world’s first safety utensil designed for dogs. Many people feed their dog canned food from a utensil, or as a treat. The dog fork’s patented design prevents the fork from getting pulled from your hand. My Best Friend’s Fork makes a great gift for any dog lover! Have you ever experienced that scary, oh-crap-what-has-my-dog-eaten moment? You heard the crunch, the smack of jowls, and maybe saw the guilty expression on the dog’s downcast face. 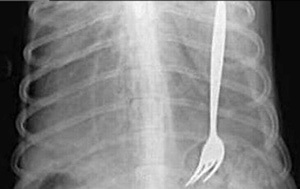 A harried trip to the vet reveals … gasp … a FORK! My Best Friend’s Fork is veterinarian recommended and approved. Vets suggest sneaking medicine into a spoon full of food to make pill taking easier. Dog’s will swallow anything, and you don’t want your best friend making an unnecessary trip to the vet. Each fork is made from stainless steel, so it won’t bend or break with normal use. The fork prongs are designed to be gentle on the animals mouth with it’s rounded edges and two short prongs. If you give your dog treats or food, using My Best Friend’s Fork allows you to give them something without getting something in return. Dog slobber is considered clean by scientist but most people wouldn’t agree! My Best Friend’s Fork is veterinarian recommended and approved. Dog’s will swallow anything, and you don’t want your best friend making an unnecessary trip to the vet.